I recently stumbled across a 30-year-old article from a trade magazine, which predicted that the domestic TV would become a 'home-entertainment' hub. 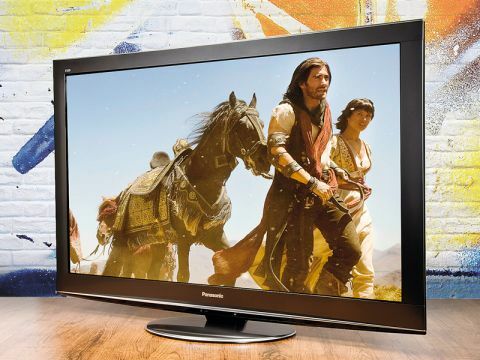 Looking at TVs like Panasonic's TX-P50V20B, you have to admit they were right. As if its 'hang-on-the-wall' nature and full HD resolution weren't enough, this big-screen is liberally endowed with other technology and features. Built in are tuners for standard and high-definition digital satellite (Freesat HD) as well as digital terrestrial (Freeview HD); in a nod to the old, there's an analogue tuner, too. A CI slot allows CAMs for Pay TV, while a pair of USB ports allow gadgets and storage media to be attached. An SD memory card slot is also provided for playing multimedia files. Other external sources are catered for with four 1080p24-capable HDMI ports. Additional inputs include component, two Scarts and a VGA terminal. One ancient technology – Teletext – is also built in, but along with its slicker digital equivalent. This TV can be connected to the internet – a wired Ethernet or Wi-Fi dongle enable it to join your home network and access the Viera Cast portal, which features Acetrax (movies on demand), YouTube, Picasa, Twitter, news feeds, etc. The aforementioned multimedia player can also pull music, video or photos from compatible PCs or servers that share your network. Want more? Then buy Panasonic's optional USB camera, and your TV is transformed into a videophone. For all this, the TX-P50V20B is easy to set up and use and performance is excellent. Blu-rays deliver a crisp and detailed picture of exemplary contrast range, outstanding black levels and sublime colour. Hi-def TV, from Freesat HD and Freeview HD alike, is also impressive. SD digital TV does not, alas, fare quite so well, thanks to artefacting and a lack of resolution. Also disappointing is the sound, which is rather flat and imparts a boxy character to speech. Here's one area in which older TVs often surpass the new. The TX-P50V20B's amps and speakers may suffice for everyday use, but for movies and music rely on your separate audio system. Overall, though, this is a 21st-century wonder box. Anyone care to predict what TVs will be like in another 30 years?